Dice the avocado insides into small pieces and place in a medium bowl. Add the remainder of the ingredients to the bowl and toss gently until mixed together. 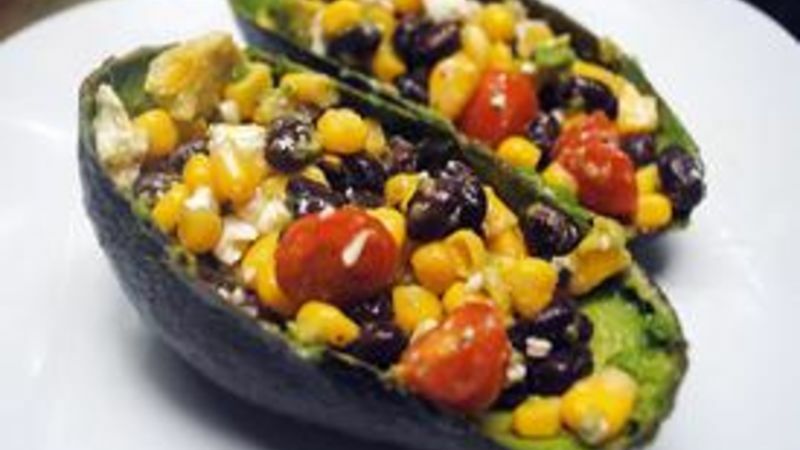 For a pretty presentation, spoon the mixture back into the avocado shells and serve. I have a love/hate relationship with the end of summer. I live in North Carolina and right now it as hot as all get out, so I’m ready for some cooler, fall weather. But I can’t help but love the carefree foods of summer. Labor Day is typically when you have that last big summer cookout. And other than what’s on the grill, it’s all about the side dishes. I found 10 side dishes in Tablespoon’s arsenal that will make you want to call over the neighbors and party it up! A burger and fries are basically an American institution. Make your own French fries with this über easy recipe. This classic recipe uses a slow cooker for easy preparation and is a guaranteed winner at your Labor Day cookout. It’s almost criminal to have a bbq without corn. Branch out and try with chile lime. Bread in a salad? Yes, please! Now you don’t have to make a decision between guacamole and salsa - you can have both in one with this delicious salsa-guacamole recipe! If you’re craving potato salad but not craving the calories, try this “Healthified" version. If you’re in the mood for Italian, try this super easy antipasto salad with balsamic vinaigrette! Looking for a more traditional salad? Look no farther than pasta to complete your craving. This unusual, yummy salad is served cold for hot summer days! This colorful salad is served in individual avocado shells for a pretty presentation! After thinking about all these summer side dishes, I don't think I want summer to be over! Happy Labor Day!